Since Meta released their school themed autumn collection, I've been thinking about making something along those lines. So I set to work on this grey jsk. The fabric is quite heavy and it is fully lined with a lighter grey. 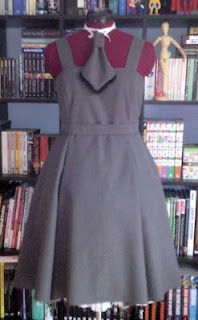 Its not quite finished yet - it needs hemming properly. I am thinking about attaching the hem to the lining. I'm not sure of the technical term. I intend to coordinate it with a school style stripey blazer I got from new look and a white blouse. I'm not sure what sock would be best - white, black or grey. I've also done a cute little tie to go with it. These are really easy to do (you can hand sew them) - and can be made with the scraps left over from cutting the dress. I've added a little brooch on this one. I've made a couple of variations and I'm going to post up a little tutorial with the pattern I made as soon as I have time! This week I haven't been able to use my machine so I thought I'd see what I could make using only hand sewing. 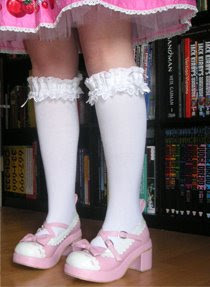 As you can see that was some sock toppers or garters (what ever you want to call them) I think these are a great alternative to expensive brand socks and you can customise them to your style. Lace - make sure you choose some nice quality lace, I've used the cotton kind. A piece of 5mm wide elastic and maybe some ribbon or other decoration. A safety pin will also be useful. First cut two 50cm pieces of each lace. Then sew the edges of the top and bottom pieces together making two extra wide pieces of lace, these are the back of the sock topper. Next sew the middle frill design down the centre of each piece. Then sew the eyelet lace on top - making sure to sew down each side creating a channel between this layer and the one below. This is where you will put your elastic. Cut two pieces of elastic that will fit around your calf when slightly stretched and that will still stretch over your foot. You can check this by pinning the ends together with the safety pin and trying it on. Is it comfortable? You don't want it to dig in to your skin - but if its too loose it won't stay up! Next pin one end of your elastic onto the safety pin and thread it through the channel between the lace. 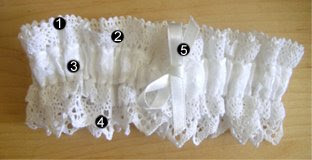 The lace will ruffle up as the elastic is shorter than the lace. Make sure you keep hold of the other end of the lace! Sew the ends of the elastic together securely. Then finish off by neatly sewing the raw lace edges together on the inside. Done! You can make wrist cuffs in exactly the same way - you just use slightly shorter lengths since your wrists are probably thinner than your knees!! 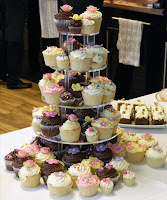 Last week we had afternoon tea at work and it included these gorgeous cakes. They looked cool and tasted amazing, way better than mine! 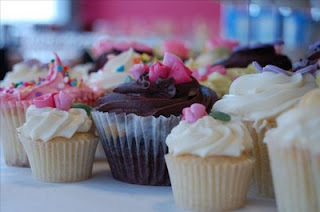 These tasty treats were made by Amanda at Fancie.